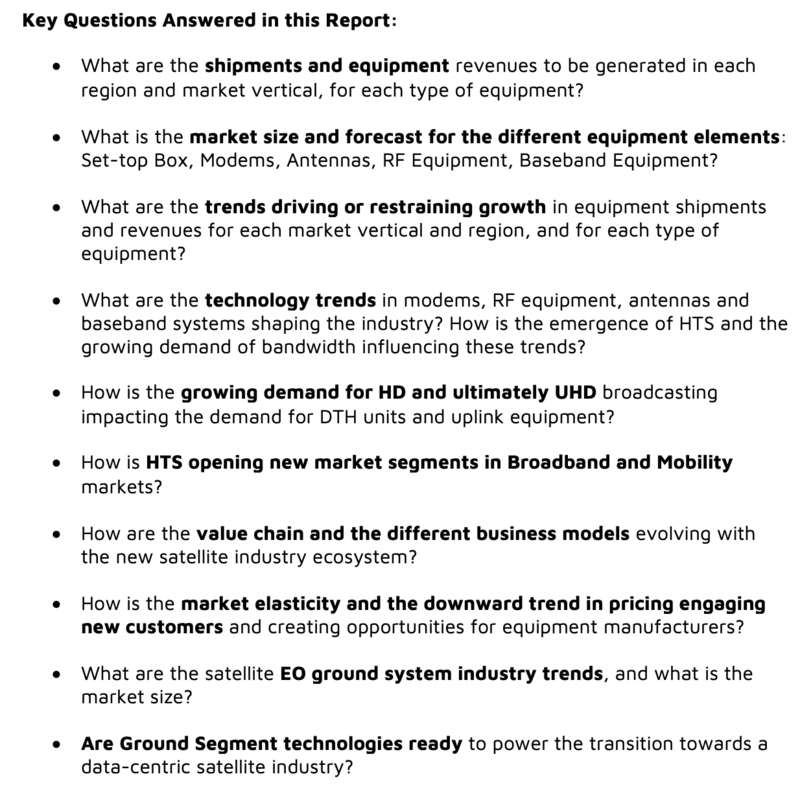 The assessment covers shipments and equipment revenues in five regional markets, investigates trends impacting market growth and business models, and surveys technological trends shaping the future of the ground equipment and impacting the satellite industry as a whole. 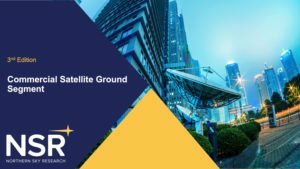 NSR’s Commercial Satellite Ground Segment 3rd Edition report analyzes the market opportunities, technology trends and the ground segment impact on the overall satellite industry. This coverage is framed within NSR’s traditional depth of industry knowledge analyzing all key segments with unmatched level of detail. The report combines the wide and well-grounded NSR analysis for each key vertical market in a single report with specific focus on terminals and ground infrastructure. The report assesses shipments and revenues for each element of ground equipment including STB, antennas, RF equipment, modems and baseband equipment. 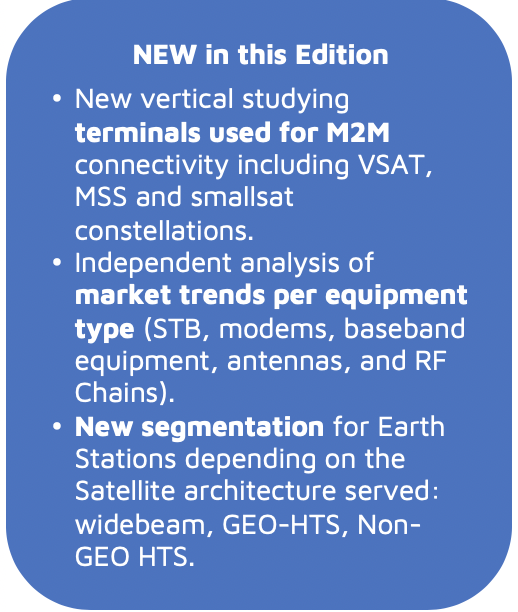 NSR’s Commercial Satellite Ground Segment, 3rd Edition is based on long standing methodologies that have been validated and improved over NSR’s varied base of reports. NSR rigorously tracks the public announcements of all major players across the value chain and has carried extensive interviews to build base year data and carefully formulate forecast data. The forecast period for all market segments covers ten years, and in this CSGS3 study, the market assessment runs from 2017 to 2027. 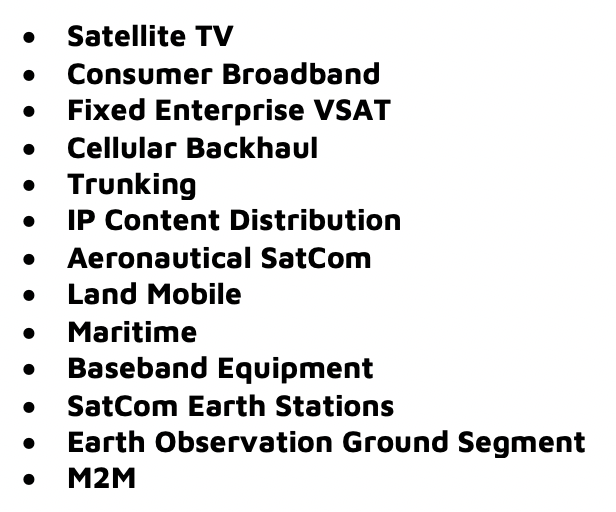 The report outlines the Satellite Equipment markets structured in 13 key segments: Satellite TV, Consumer Broadband, Enterprise VSAT, Backhaul, Trunking, IP Content Distribution, Aeronautical Satcom, Maritime Satcom, Land Mobile, Baseband, Satcom Earth Stations, EO Ground Stations and M2M. Forecasts are broken down in 5 regions: NAM, LAM, EU, MEA and ASIA. Forecasts are also structured by equipment type when relevant (STB, modem, antennas, RF Chains). 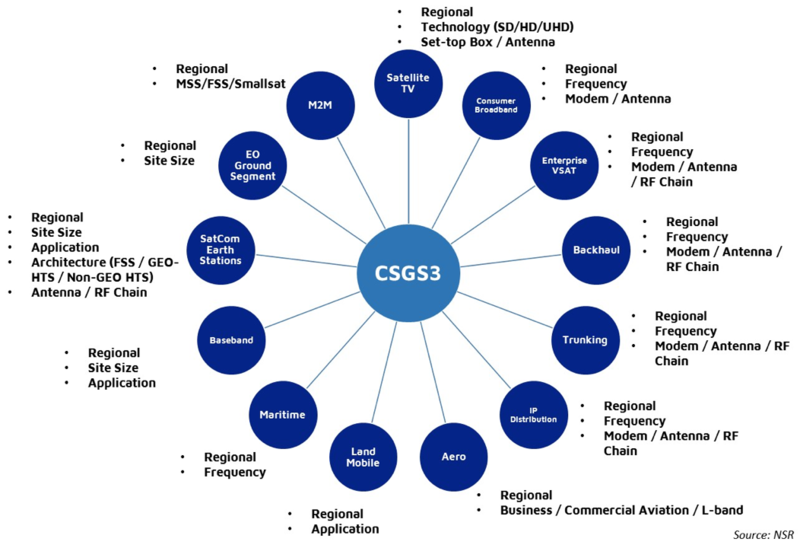 Companies and Organizations mentioned in NSR’s CSGS3: Hughes, ViaSat, iDirect, Gilat, Newtec, Advantech Wireless, Comtech, UHP, GD Satcom, CPI, Norsat, Terrasat communications, Global Invacom, Satixfy, Teledyne, Jonsa, Broadpeak, Quadrille, NEOTION, Astronics, Panasonic, Honeywell, Qest, Taznia, Tecom, Thinkom, KVH, Inmarsat, Intellian, Cobham, Orbit, KNS, Kratos, Harris, SpaceTrack, Iridium, Orbcomm, Thuraya, Intelsat, SES, Eutelsat, Telesat, OneWeb, SpaceX, O3b, LeoSat, Echostar, Forsway, ND Satcom, Zodiac Aerospace, Harris Corporation, L3 Datron, Maxar Technologies, Kongsberg, Orbital Systems, and CGC.